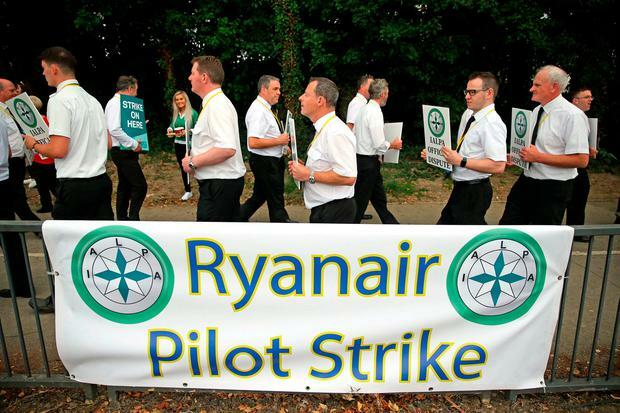 Ryanair pilots picketed Dublin Airport last week. Ryanair have invited officials from unions representing pilots to hold talks with them. In a letter issued to FORSA earlier this afternoon, the airline have invited union officials to talks between the two sides in a bid to resolve the dispute. If the union accepts their offer, Ryanair have requested they call off the planned work stoppages on Friday, July 20th, and Tuesday, July 24th. If the union don't agree, Ryanair say they will inform passengers tomorrow of cancelled flights giving them enough time to make rearrangements. "While this working group is making progress, may we suggest that further strikes by just 95 of our Irish pilots are postponed to avoid disrupting the holiday travel plans of Irish families next Friday. If you do not agree to a postponement by 17:00hrs today, then we plan on Tuesday to cancel 24 flights next Friday (mainly between the UK and Ireland) to give these customers more time to re-accommodate on other flights or request refunds," the airline said.